Report of H.L. Strickler, Commissioner to Audit Claims of Citizens of the Territory of Kansas, contained in the U.S. Congressional Serial Set of congressiona and executive documents. 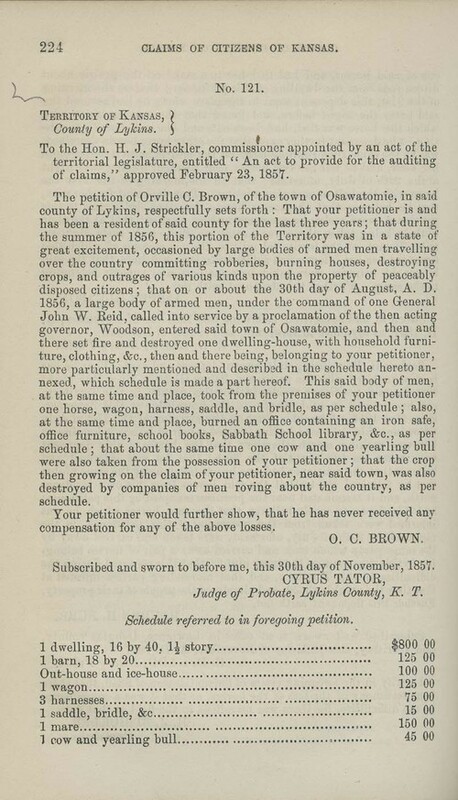 Orville C. Brown submitted claim # 121 for losses sustained during the summer of 1856 from various groups of armed men. He also claimed that his house was destroyed by men under the command of General John W. Reid on August 30, 1856. His detailed list included a number of household goods as well as some school and Sunday School books. Each claimant had to submit an itemized list and have two witnesses attest to the losses claimed. Even though many of these claims were approved for payment, no funds were ever appropriated or distributed.